So I was wondering how this weight works and whether I should start mangling around with it or just forget that it exists. Also, I forgot to check where its original "factory" position was and I don't know whether it can shift from that position after some rugged landings or just with time and centrifugal forces of tricks. So any insight will be appreciated. P.S. Yesterday was a perfect flying morning: winds around 15-18Km/h steady and constant, nice sunny beach day with temperature around 25ºC. It's the factory fitted 6grm weight, there to help with pitch tricks like yoyos. Works fine, just forget it's there. But the weight can be shifted up or down the spine and I don't know whether it is in the "correct" position or out of it since I had not noticed it before (what a crappy observer I am...). It is now exactly 1cm from the bottom. Is that good? Mine's a little brass doughnut which slides onto the bottom of the spine above the T piece ( where the leech lines go round) and below the velcro. That said, I bought my Soul pre owned so it may not be original. 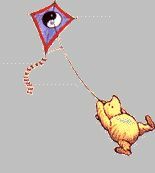 I've never found the need to move, remove or add to the standard weight, the kite flies just fine as it is. This is what the tail of my Soul looks like. Hadge's description matches this, but what Adamld13 says does not seem to be the same. I have 2 souls and the one i bought brand new did have the same set up as you described. You can see on the yellow one i put some electrical tape to hold the weight close to the tail. So it is unclear where the weight should actually go... is that it? With mine, I'm having troubles trying to get it into a fade. and I then pull to get it into the fade. Although everything seems to work fine, it rarely holds itself for too long in the fade. It starts to swing forward and backward (the tip up & down) and then tips down to exit the fade flying downwards again. Am I trying to be too smart about this? I mean, is this only a story I'm making up to compensate for my lack of precision in flying the Soul? BTW, why do you rarely fly the yellow one? Is it a matter of color or is there any other reason? I reframed the yellow one with dynamic t10. It's pretty light but I have to replace all the fittings...everything is loose. I prefer to fly the blue std .... Just feels better. Both kites can fade quite well. I'm not sure how much weight is on my blue std but I'm sure it's a lot more than the donut weight. Sounds like you are keeping too much tension on the fade or not enough when it goes nose up. The kite will oscillate while fading. You have to tend it while oscillating with light tension and slack during the oscillation so as not to let it go too nose high or roll down. I doubt moving the weight even half an inch will affect it. Just an opinion/observation based on what you have written. Sounds like you are keeping too much tension on the fade or not enough when it goes nose up. The kite will oscillate while fading. You have to tend it while oscillating with light tension and slack during the oscillation so as not to let it go too nose high or roll down. Thanks justinpwheeler. I'll exercise more on the fade with these suggestions. Some kites are just very difficult to fade, but I don't think that this one is. I've only flown one briefly some time ago, but I remember it being pretty stable. Keep practicing, you'll get there. I guess I'll stay away from the tail weight and try to be smoother with my fade technique.